Manitoba maples, Acer negundo, can also be tapped to make maple syrup and sugar. Although commercial syrup comes exclusively from the sugar maple, A. saccharum, sap from other maple species can also be used. Similar syrups can be made from other tree species such as birch and palm. Manitoba maples (or box elders) are generally considered an invasive weed species here in southern Ontario. 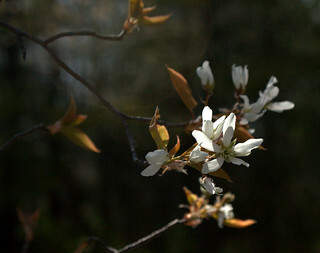 They are one of the first and most abundant tree species to colonize disturbed ground, especially bottomland. Urban foragers might find an opportunity in this abundance. Syrup production may be labour-intensive, but we forage because we can, right? It is all about finding nutrition and flavour in unexpected places. As a child I played in a small woodlot full of Manitoba maples. Their sprawling, thick trunks were ideal for climbing and building treeforts. I remember tasting sap from the nail wounds. Like other saps it had only a hint of taste, more brightness than sweetness. I might even have tried to boil some down. Another idea probably distracted me before the job could be completed. I had no idea Manitoba maple syrup has a long history. I learned about it this morning while reading I Have Lived Here Since the World Began: An Illustrated History of Canada’s Native People, by Arthur J. Ray. Iroquois and French-Canadian voyageurs travelling between Montreal and Central Canada in the 18th Century, to supplement the corn hominy and pork fat they carried with them, purchased food from native groups along the route. The Ojibwa living west of Lake Superior produced, among other things, Manitoba maple syrup. According to Aagaard Farms in Brandon, people in those parts continue to tap Manitoba maples. Sugar maples have trouble establishing themselves in the Prairies due to severe winter cold. Maybe urbanites elsewhere can take this lesson in resourcefulness from the Ojibwa and Manitobans. This syrup is different, having a flavour that is variously described as slightly vanilla, herbal or musty compared to sugar maple syrup. Today at University of Guelph Arboretum, fabric artist Lorraine Roy described her career to illustrate different ways of interacting with nature. As part of a series presented by the Department of Plant Agriculture, Roy’s seminar addressed: “Embroidered Tree: My Journey With Science and Art”. Roy’s roots have grown deep at Guelph Arboretum. She graduated from the university’s horticulture program. She says it was paradise for her to work with the visionary R.J. Hilton, who worked in the 1960s and 1970s to set aside land for the arboretum. Roy helped upkeep an international woody plants seed exchange program, collecting and distributing seeds to other arboreta around the world. This nurtured a fascination with seeds and trees that began in childhood. “I am not a scientist,” Roy claims. Her career as an artist began in 1986. However, her works ever since bear evidence of a continuing study of trees and geoscience. The fabric paintings use natural elements to explore philosophical matters. Roy says people identify with trees because of their upright form, the expressive gestures of their limbs and the way roots dig into unseen truth. Trees have appeared as significant symbols in most mythologies and religions: for example, the Tree of Life and Tree of Knowledge in Christianity. Celtic cultures venerated the oak; they considered it bad luck to cut down a hawthorn, but good luck to bring branches of the spring blossoms into a house. Roy depicts trees growing on the Niagara Escarpment as symbols of triumph over adversity. From early tree subjects, Roy’s works have delved deeper into the stories of seeds and soil. Seeds present a perfect “marriage of form and function,” she says. In autumn the cherry birch, Betula lenta, produces winged seeds designed to distribute by blowing across the snow. The Kentucky coffeetree, Gymnocladus dioica, supplies its beans with a nutritious supply of protein. In all these works, a seed is not just a seed: it is a chinquapin oak acorn or a saskatoon berry. The branch, leaves, seedlings, soil and rocks all reveal aspects of true life. Roy says that science looks for knowledge, while art seeks to make that knowledge more accessible. However, art also makes truth more appealing. Artists can be prophets by drawing our attention to things. These wall hangings introduce viewers to some of our rarest and most threatened woody species. Seeing the beauty, we must also acknowledge its transcience. This frost-damaged magnolia is in the Japanese garden at University of Guelph Arboretum. What is so alluring about growing herbs in a garden? Hardly any of them are showy plants. You cannot eat enough to make a meal out of any of them. Nevertheless, if I had only time and space on a windowsill, I would most likely choose to grow one or two herbs over any other plant. I do not know where this love of herbs came from. The only edible plants my mother grew were parsley, chives and rhubarb, probably dug from my great grandmother’s garden. Herbs were just dull powders in bottles on a high kitchen shelf. In the early 1970s Ranger Rick magazine ran an article with instructions on starting an organic vegetable garden. That is where this whole idea about growing my own food started. The same kids’ magazine started me thinking about solar, wind and geothermal power, but that is another story. Within a year or two of starting my vegetable garden, I began ordering herb seeds from Stokes Seeds. I sowed them all neatly in rows according to package instructions, then probably proceeded to neglect them. I remember three or four thyme seedlings surviving, a few sage, and maybe one or two rosemary. Of course I had no way of knowing (and nobody in my family knew) that was all we needed for a beginning. What are your favourite herbs? Why do you enjoy growing them? I already have plants of chives, rosemary and some scented geraniums I bought last summer when we moved here. Today the first rain fell in more than two weeks. Hopefully the rest of the spring will not be so dry. This evening I planted a few more things in the garden: shallot sets, and seeds of Italian parsley, borage and mammoth dill. March 27: I sowed Lincoln peas, rainbow chard and Bloomsdale spinach (all seeds from Urban Harvest) in the front bed. I made holes in the underlying carboard, made cups in the straw around the holes, filled the cups with starter soil and planted the seeds. I added the primroses a few days later in memory of Mom. Although barely hardy in Ontario, they used to thrive and spread into big clumps in the sunny, south-facing bed under our family room window back home. April 4: Friends Doug and Janette gave me some used chicken bedding, three big buckets of it. It is nice and rich. It also came with same red wrigglers. I added a few of them along with a hefty handful of chicken poop to the Worm Chalet, because the population there seemed to have dropped. I decided to experiment with planting seed potatoes in cardboard boxes set on top of the beds. That will allow compost to be added as they grow. This will also make it easy provide frost protection for any sprouts that emerge. When they are ready for harvest, hopefully I can just tear the boxes apart. If we get a lot of wet weather the cardboard might need to be reinforced somehow. Four to six spuds of one variety went in each box: Warba, Norland and Bintje. Today: I made a pocket of compost around the sun-facing edges of the boxes and planted seeds for more early crops: German giant radish from Urban Harvest, and local lettuce and arugula. Along the front edge of the front bed I cut a trench, filled it with compost and planted evergreen bunching onion (Urban Harvest). We have a groundhog living under the shed and a pair of rabbits frequenting our yard. I have no choice but to put a small fence around the garden. This is an urgent priority. If any luscious little pea sprouts emerge, they will not stand a chance. At Seedy Saturday I picked up a brochure for a permaculture design course taking place over two weeks this summer. However, the cost is prohibitive: $988 registration plus $390 for meals and a minimum $140 for accommodation. The promotional material gives no evidence of scholarships. Over the past 15 years websites on this topic have shifted away from providing a wealth of information toward advertizing expensive training courses like this one. It is a shame when wisdom becomes a commodity. Permaculture could improve the nutrition of low-income urban families, but not if we allow the knowledge to become inaccessible. Yesterday we went to Guelph’s Seedy Saturday at Norfolk United Church. I brought home a few more ideas along with packages of heirloom vegetable and wildflowers seeds. Seedy Saturdays began in Canada in 1990, encouraging communities to share locally-adapted, non-hybrid plant varieties. I first attended one in Toronto in 1997 as a vendor of handmade papers, many incorporating wildflower seeds. Numerous Seedy Saturdays and Seedy Sundays are organized under the auspices of Seeds of Diversity, a volunteer organization concerned with conserving biodiversity and traditional horticultural knowledge. Its website lists a few more of these events occurring in small cities across Canada this month. Other similar events like the one in Guelph seem to have sprung up independently. Best find of the day was a seed potato collection including three varieties: Bintje, Norland and Warba. I purchased a few more packets of commercial heirloom varieties, but also a few from plants that have grown in Guelph for several generations; arugula, calendula, lettuce, tithonia (Mexican sunflower) and zinnia. The latter two are supposed to be good for attracting pollinators. The most interesting new local enterprise is the Guelph Community Orchard Project, which aims to build community, improve local environment, foster awareness of fruit and nut trees, and increase food security. It received its first grant from Tree Canada a few days ago and has launched a new blog. For the permaculture garden, I began by choosing the best site in the yard. Most vegetables and herbs prefer full sun. This section gets a little morning shade, but full sun from late morning through early evening. I decided to make two long mounds with a trench in between. No one is ever supposed to walk on the beds, so they have to be narrow enough for easy access. I laid out a plot 10 feet wide by 26 feet long. That means Van’s feet, a more organic system than metric or Imperial. The trenches should be as level as possible so water won’t all run down to one end (irrigation, if necessary, will be applied to the trenches). I had a hard time because the garden slopes considerably down toward the back fence. Instead of levelling it all out I decided to make dams, but for now the shovel will do. Digging a garden is hard work, especially when you are out of shape. I worked for a few minutes at a time whenever I had some to spare this week, edging my way into it. I was grateful for an early spring so I do not have to finish it all in a rush six weeks from now. This afternoon the trenches and mounds are finally finished. Now the fun begins. And I mean fun, because the worst is over with all that shovelling. The rest feels much more creative. Next a layer of manure goes on top of the mounds, as thick as you can make it. A sprinkling of bone meal helps balance nutrients and soil pH. Over that goes a triple layer of wet cardboard. This smothers any grass and weeds and stabilizes the mounds to prevent erosion. The cardboard should cover the bottom of the trenches, too. Finally, a layer of straw mulch goes on top. Leaves would work as well. Brock Road Nursery gave us two old bales of straw for free, a sensible and neighbourly thing to do. Today I ran out of manure, bone meal and disposable cardboard, but there is more to come. For now I have enough space to start planting some early crops that tolerate cool weather and soil: radishes, spinach, peas, chard and bunching onions. Years ago I started a permaculture garden by a similar method. I made holes in the cardboard and planted tomatoes, squash and other seedlings in the compost underneath. I never planted seeds until the beds were established and I had soil to work with. Geoff Lawton recommends making the holes just big enough for taproots to go through the cardboard, and planting seeds and seedlings in pockets of compost in the top layer of straw. They need to be watered vigilantly from above until the taproot grows through. I’m nervous about that, but will give it a try. Next nice day, I will plant seeds. Weather: weird, worrying or wonderful? This afternoon we took a break to walk 20 minutes to the supermarket. We dressed in shorts and short sleaves. Along the way a Forsythia and crocuses were in full bloom. Normally in Guelph we might expect to see these things a month from now. 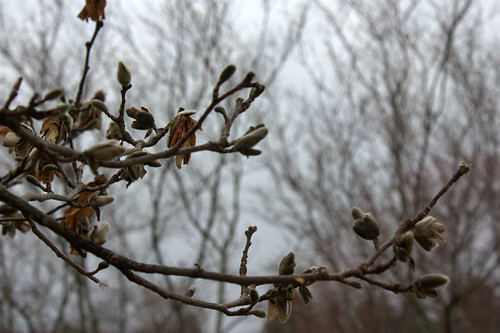 Meanwhile buds were bursting on a magnolia, a dogwood, a maple and a lilac, all six weeks ahead. Spring is burning to catch up with itself. It is lovely. It is also frightening. Extreme weather is normal, but this is no quick flash. The average winter daily high here was above freezing. Looking at it a different way, the daytime temperature only stayed below freezing 18 times between Dec. 22 and the Mar. 21. The weather is expected to cool off Friday, but there is still no sign of frost in the long-range forecast. What place is this? Surely not Ontario? Our normal last frost date around here is supposed to be May 9. Setting aside the bigger question of climate change, we ought to consider how this affects our environment, economy and food sources right now. Add to this heat a lack of rain and we have a long trend of extremely unusual conditions. Global warming was supposed to bring an economic advantage to cooler temperate climates like this. Farmers must be tempted to plant their crops early, but no one living can assess the risk of planting in Ontario in March. As soon as I finish digging the backyard garden I intend to plant lettuce, peas and onions, things that tolerate cool weather and frost. If I decide to plant tomatoes a month early, I risk only a few dollars’ worth of seeds and supplies. It is not my livelihood. The dry weather is bound to kill off blackflies and mosquitoes early. People will not complain about that. Birds, on the other hand, might suffer severely. As swallows and warblers begin arriving hungry after migrating thousands of kilometres, who can say whether a suitable diet will await them? No one has performed this experiment before. One thing we can expect: plenty of strange weather variations to come. Hunter Lovins of Rocky Mountain Institute called it “global weirding.” Right here and now, it is beautiful, but we should all be a little frightened. Besides that, I must admit to a fascination about what happens next, and how the world will adapt. Who could have believed I would ever eat breakfast on my birthday sitting outside in shorts? The air smells of white pines and is full of the songs of chickadees, red-winged blackbirds, cardinals, goldfinches and crows. I also glimpsed a blue jay flying overhead. I’m going to work on digging the vegetable garden while the bottom of the yard lies still in cool shadows.